A pair artists that fans didn't expect to form a close, musical relationship is rapper and pop princess . First, the Georgia rapper hopped on Grande's remix to her hit song "7 Rings" before they linked up on 2 Chainz's Rap or go to the League track "Rule the World." Grande recently began her "Sweetener Tour" and has been taking arenas by storm, but the pint-sized singer surprised Boston fans when 2 Chainz came out on stage to perform "Rule the World" live for the first time ever. The two artists later thanked each other openly on social media. "Love u @2chainz 🖤 thanks for surprising boston w me #ruletheworld 🌑," Grande wrote. 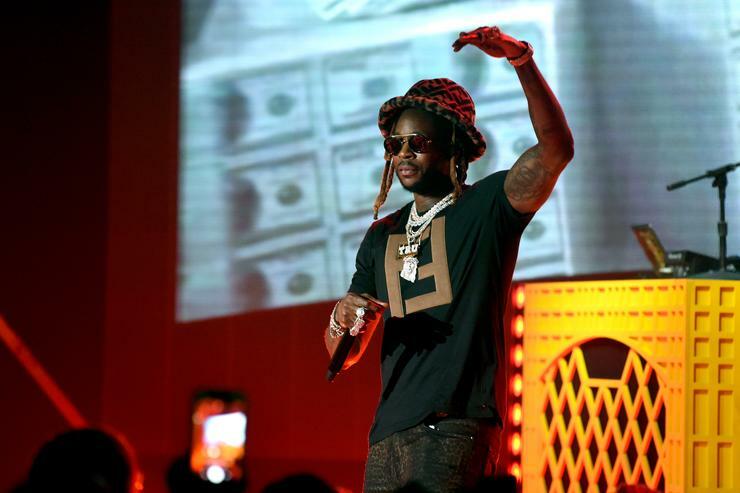 2 Chainz responded, "THIS SONG #ruletheworld HAS BEEN OUT FOR TWO WEEKS 🙏🏿☝🏿🚀🔥 the show was lit !!! thank you @ArianaGrande thank you BOSTON #raporgototheleague out now !!!! Sincerely yours , Boston Toni 💪🏿." There's no word on what other tricks Grande may have up her sleeves for the remainder her tour, but the singer has reportedly been paying tribute to her late ex-boyfriend before her shows begin by playing his tracks as fans wait for the show to start. The 25-year-old is also doing her part and using her tour as a way to get people registered to vote through her "#ThankUNextGen" campaign. "Ariana has been very, very involved with this from day one," HeadCount Director Communications Aaron Ghitelman told Newsweek. The campaign will follow up with those who sign up and register, reminding them to vote. "It’s this hybrid field and digital thing where it’s not just what we capture live at the concert," Ghitelman said. "It creates this open highway sorts communications and actions taken beyond the concert when the fan goes home."